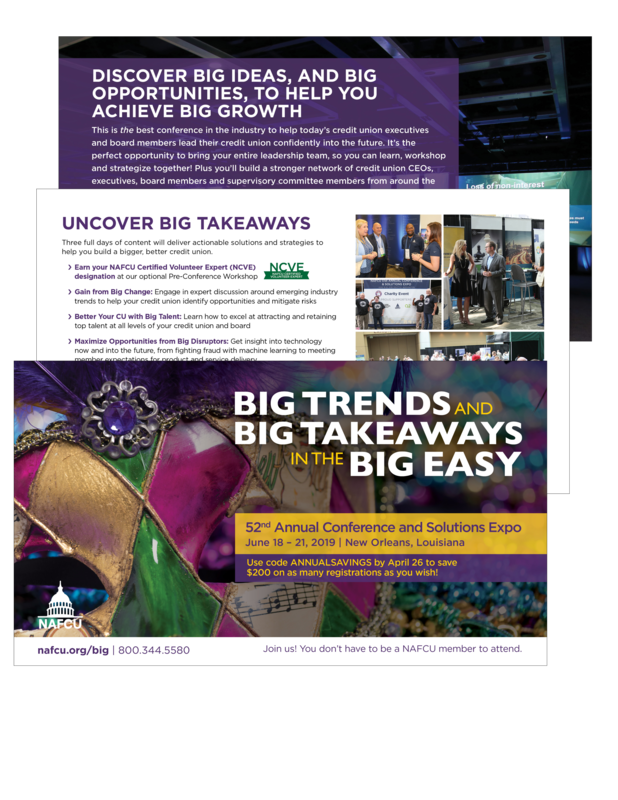 You’ll discover big ideas, and big opportunities, to help you achieve big growth at NAFCU’s 52nd Annual Conference & Solutions Expo in New Orleans, Louisiana. This is the best conference in the industry to help today's credit union executives and board members lead your credit union confidently into the future—you’re encouraged to bring your entire leadership team! And don’t forget the city itself! It's no wonder The New York Times ranked New Orleans as #1 on its Places to Go 2018 list. The Big Easy is famous for its delicious food, unique culture, vibrant music, and much more. The city crackles with energy best summed up by the Cajun phrase "laissez les bon temps rouler"…let the good times roll! NAFCU’s Annual Conference & Solutions Expo is an amazing experience. The ideas are second-to-none. We will be back next year! The opportunity to earn the NAFCU Certified Volunteer Expert designation, plus our bestselling handbook containing key, easy-to-find information to help you perform your duties. Both available when you attend the NCVE pre-conference workshop (additional costs apply for workshop and certification exam). Download the 52nd Annual Conference and Solutions Expo Brochure! NAFCU's Solutions Expo is the hub for the latest technologies, applications and resources available to improve your credit union operations and efficiencies, drive new income, and better serve your members. Visit the NAFCU Services Preferred Partner Pavilion to engage with top-picked solution providers. All Preferred Partners have been peer-approved as superior in their solution category. Contact us to learn more about exhibiting in the expo.